Gayanthika Abeyrathne made up for her disappointing performance in the women’s 800m by clinching the gold medal in the 1500m race at the 8th Asian Indoor Athletics Championship being held in Tehran, Iran. Abeyrathne clocked an impressive 4 mins 26.22secs to win the title. She was placed fourth in the 800m race earlier with a time of 2 mins 11.20 secs. Sri Lanka had so far won three medals. 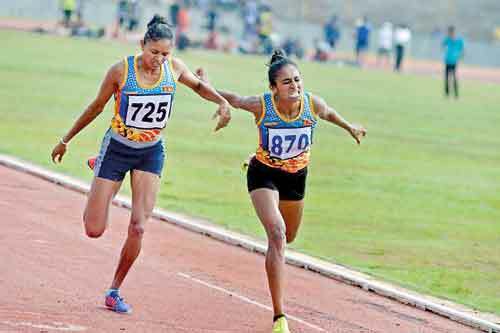 Earlier Nimali Liyanarachchi won bronze in the women’s 800m with a time of 2 mins 10.83secs while Upamalika Ratnakumari also won a bronze in the women’s 400m dash with a time of 54.49secs. Both Abeyrathne and Liyanarachchi are among the 12 athletes selected for the Commonwealth Games to be held in Gold Coast, Australia in April. Men’s Team: Manjula Kumara – High Jump, Sampath Ranasinghe – Javelin Throw, Prasad Wimalasiri – Long Jump, Vinoj Suranjaya – Himasha Eshan, Shehan Ambepitiya, Ashroff Latheef and Sumesh Wickramasinghe – 100×4.